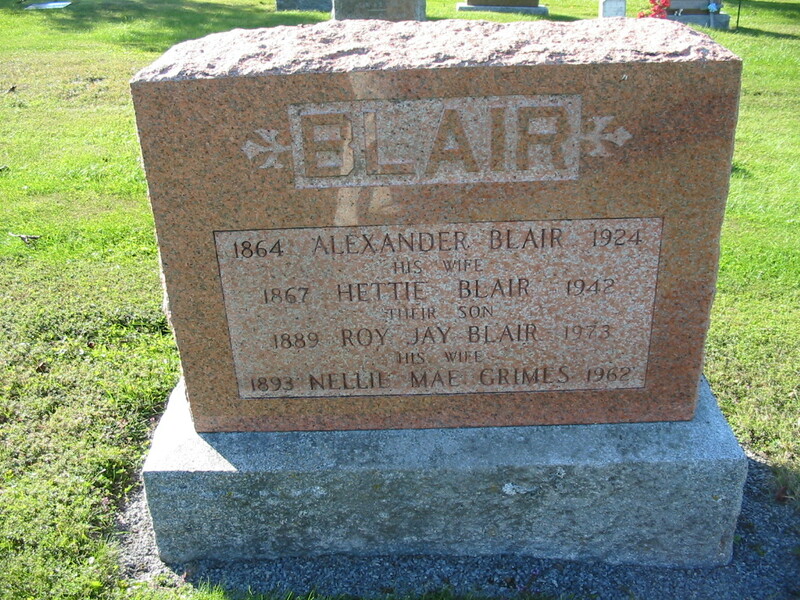 Thomas BLAIR (1832 – 1909) was Alex’s 3rd Great Grandfather; one of 16 in this generation. Thomas Blair was born 8 Apr 1832 . He was baptized two months later 10 Jun 1832 at the Presbyterian Church of Hemmingford Quebec by Rev. John Merlin with their residence recorded as Hinchinbrooke. 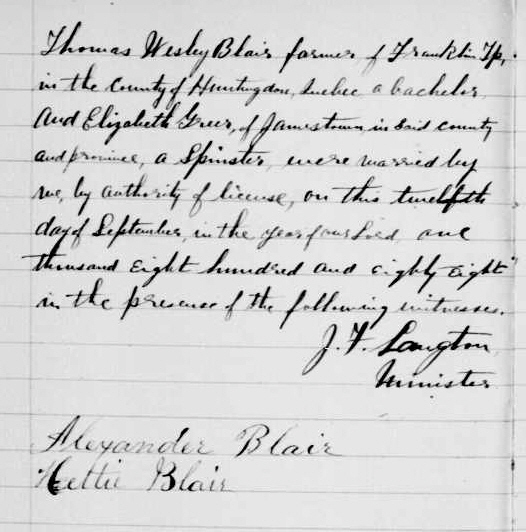 Witnesses were Thomas Blair (I wonder if this Thomas was a relative) and John Black. On their census forms, his sons Thomas Wesley and William Lewis consistently claimed that their father was born in New York. It is at least possible that this assertion is true. Hemmingford is only three miles north of the US border. Thomas’ father came with wife and four small children from Armagh County, Ireland, in the spring of 1830. They visited with relatives before moving to Frontier, New York, just across the border from Canada. In 1837 they moved to Franklin Township, Quebec and got a farm of 200 aces, most all it it well timbered, clears a piece and built a home for themselves. Thomas was baptized by Rev John Merlin at the Presbyterian Church of Hemmingford Quebec when he was two months old. 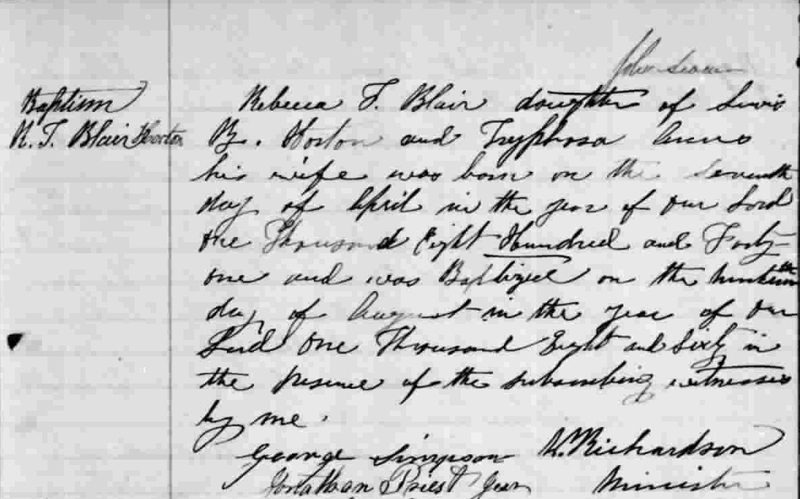 Thomas’ parents were William BLAIR and Mary HUESTON. 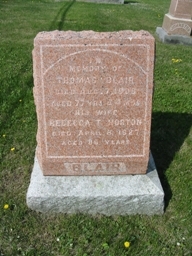 He married Rebecca Triphosa HORTON on 5 July 1859 in Franklin Center, Quebec. Thomas died 7 Aug 1909 at the age of 77 and is buried in Franklin Center Cemeterey. called Russelltown Burying Ground in church records and Cantwell Cemetery by some local residents, is located a short distance to the east of Franklin Center Quebec. Rebecca Tryphosa Horton was born 7 Apr 1841 probably in New York. Her parents were Louis B. HORTON and Tryphosa AMES. She was baptized 19 Aug 1860 in Wesleyan Methodist Congregation in the Russelltown Circuit; Franklin Methodist. Rebecca’s birthplace shows as USA in the 1881 Canadian census. Rebecca died 8 Apr 1927 at the age of 86 and is also buried in the Franklin Center Cemeterey. Jamestown, Quebec After 1930 California? Here are Google Map Directions of the places mentioned in Thomas’ life. They are all within a few miles of each other in New York and Quebec. The family is recorded as farmers in Franklin Quebec in the 1881 Canadian census. Thomas Wesley’s name shows as Wesley. Franklin Center and Huntingdon County were mostly English speaking between when the Blairs lived there, but Wikipedia shows it to be 75% French speaking today. The Arcadians were forced out in the 1760’s after the defeat of France, many moving to Louisiana. Cajun is a derived from the root Arcadian. In William D.Reid’s definitive book, THE LOYALISTS IN ONTARIO, two Horton families are listed. An Isaac Horton, born 1750 in Westchester, New York, settled in Pelham. His family consists of 8 children, all of whom made petitions for land grants as the children of Loyalists. The children were: Isaac, Ann, Elizabeth, Mary, Rebecca, David, William, and Daniel. David Horton’s petition was made in 1822. 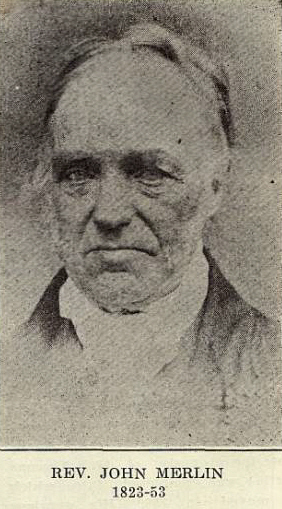 He is said to have lived in Gainsborough, which would make it possible that this is the same David Horton who was the husband of Helen and father of Eliza Ellen Rogers. Alexander was baptized in the Wesleyan Methodist Congregation in the Russelltown Circuit; Franklin Methodist on 29 Mar 1864. He married his cousin Hettie Blair, youngest surviving daughter of his Uncle William Blair 30 May 1888 at Franklin, at the residence of the bride’s father, by Rev. James O. Hara. Hettie Blair was born 8 Feb 1867. Her parents were William Blair and Hannah Adelia Morrison. Hettie died 12 Jul 1942. 1889 – Thomas’s son Alexander and daughter-in-law Hettie were living in the kitchen part of his house (Uncle Zan and Aunt Hetty) The homestead was an enchanted spot with an abundance of flowers, fruit and vegetables. Hettie and Alexander were the family that took in my grandfather Horace Horton BLAIR and his sister Beulah when William Lewis BLAIR first moved the rest of the family west to Lake County, California. i. Aaron A H. Blair (1882 – 28 Dec 1911) 12-28-1911 Aaron A H. Blair, formerly of Winnipeg MB, son of the Alexander Blair, of Franklin Center PQ, died at Franklin Center PQ, aged 29 years. Origina Blair home in Ormstown Quebec, built in 1840, Grandfather Thomas Blair moved in 1870, Roy was still living in the house in 1953. Thomas Wesley Blair of Franklin Quebec, married Lizzie Grier, youngest daughter of the late William Grier, at the residence of the brides mother, in Jamestown Quebec, by the Rev. J. F. Langton, B.A. on 12 Sep 1888. Thomas’ brother and sister-in-law Alexander and Nattie (Hettie?) were witnesses. Lizzie Greer was born in June 1861 so she was five years older than Thomas. Her parents, William and Margaret, were born in Ireland. Alternatively, her father was born in Canada and her mother in Ireland. Ophir, also known as Ophirville, is a ghost town in Placer County, California. The community was named after King Solomon’s treasure. Now a suburb of Auburn, it was a boomtown of the California Gold Rush. In 1852 it was the center of the local gold mining industry, and the most populous town in the county. After the gold rush, the area was planted in vineyards and orchards, and during Prohibition just in orchards. Beginning in the 1970s vineyards again returned to the area. Today, local services for Ophir come from Auburn, 3 miles to the east. In the 1910 census, Thomas was living with his wife, daughter and mother-in-law in Newcastle, Placer, California working as a machinist in an auto garage. Thomas W Blair 42, Lizzie Blair 47, Lillean M Blair 11, Margaret Greer 79. Newcastle is a few miles southwest of Auburn on Interstate 80.
i. Lillian (Muriel) Blair (20 Nov 1898 – ); m. 6 Aug 1923 to William Arthur Sherwood (16 Nov 1892 Pennsylvania- before Jan 1930) They had one child, Lavina Rose Sherwood (c. 1925 -) In the 1930 census, Lillian and Lavina had moved back in with their parents in Oakland, California. Lavina Rose married Allan O. Blake and had four children with him. The two divorced in 1964. This entry was posted in -5th Generation, Historical Monument, Immigrant - North America, Line - Blair, Storied and tagged Birth mystery New York or Quebec, Huntingdon Quebec. Bookmark the permalink. The final section, “Children of Thomas and Lizzie,” contains incorrect information. Rose B. Sherwood is not Lavina Rose Sherwood, and Lavina Rose Sherwood did not marry Judson C. Fast. Lavina Rose married Allan O. Blake and had four children with him. The two divorced in 1964. Ron, thanks for the information, I have made the update. Lavina Rose’s great grandfather is my 2nd great grandfather so that makes us 3rd cousins once removed? Thomas Wesley’s brother William Lewis Blair came to California about the same time and settled in Lakeport. Kids came a little later. and we’ve been here ever since. When I was little, I was proud that my grandfather could drive a four horse team. Hi, Mark . . . I appreciate your reply. I really didn’t think anyone would ever see my comment, so I’m glad not only that you saw it, but also that you didn’t take it as an affront. This stuff is tricky, and I get tricked as much as anyone else. I’m not related to you. Or at least I have no reason to believe that I am. I was led to your family by a crazy twist of fate. I live in Pennsylvania, and my wife of nearly 25 years came here with me from Germany. Until recently, she and her family assumed that she was the “only” one (to anyone’s knowledge, anyway) to have come to the United States. She grew up under the Iron Curtain, so among the family she knows, the idea that anyone within living memory may have come over here was low on the list of things to ponder–until recently, anyway. When my wife took a DNA test with Ancestry.com she discovered that there are actually over a thousand people across the country who share some part of her DNA. One person in particular stood out. She was the single closest genetic match to my wife among many hundreds. My wife, in turn, was this person’s third-closest match out of over 3,500 total matches. It was a mystery we were all quite interested in solving. As it happens, this person who is so closely matched to my wife, was also adopted as an infant. Her DNA, however, has the “fingerprints” of several family lines on it, the Blair family being among them. In an effort to figure out what the connection is between this person and my wife, I ended up becoming immersed in the histories of several pioneering families like your own. I’ve gained a deep appreciation for their stories, to say the least. Anyway, if you happen to know anything that could fill in the blanks for us, I’d love to know about it. The only reason I caught the oversight in your write-up is that I happened to have only moments before sorted out some of the confusing information about that part of the family. It was a confluence of luck and short-term memory. So thanks for getting in touch. I welcome any insights you might be able to lend. Thanks for the reply, Mark! I’m back again, Mark. I’m curious to know if you could point me to any information that would shed some more light on the background of William Arthur Sherwood, whom your genealogy indicates as having been married to Lillian Blair in the 1920s. 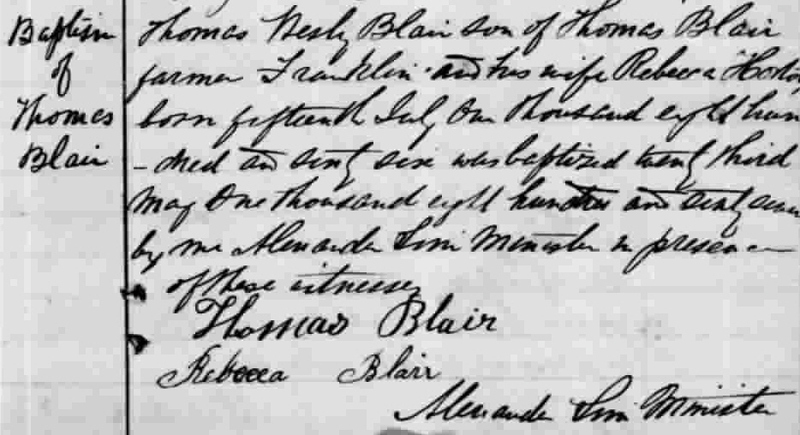 I’m still working on researching the family history of a DNA match of my wife’s, and I can’t put my finger on anything concrete regarding this person–no birth record, no marriage or divorce record, nothing–other than what is in here and in the Blair family history listed among your sources. I know it’s probably a remote branch for you, so I appreciate any information or further contacts you might be able to offer. PS: There are strong family connections to the surnames Sherbourne and Norwood for the person I’m researching. I find this interesting, considering that these names are through DNA connections, and that the trail of “W. A. Sherwood” is cold. Just an observation, in case it helps. I don’t have any further info on William Arthur Sherwood. I think I meant that he died before Jan 1930, so I made a little update. My aunt Beulah (my mom’s aunt really) was a nurse living in residence in Oakland California in 1920. She and Lillian would have been cousins with Beulah six years older. i wonder if they knew each other.